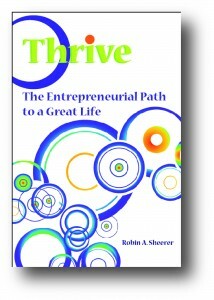 Thrive: The Entrepreneurial Path to a Great Life provides a powerful guide to designing work and a life you love, handling tough times, sticking with it, staying true to yourself, and learning the art of thriving. This is straight talk told with humor and heart, and laced with practical advice, wisdom, and true stories (including the author’s own). This book is for you if you have any of the following five fierce desires to: be your own boss; do the work you want to do; design your life the way you want it to be; work more creatively; and make as much money as you can through your own efforts. * 4 critical decisions you have to make in the lifetime of a business. Passionate about helping people blossom in their work/lives, Robin A. Sheerer founded Career Enterprises Incorporated in 1981, offering Career and Professional Development services. She provides one-on-one coaching, facilitates support groups, designs and leads workshops, and offers a free newsletter through her website. She has provided training and consulting to major companies, including John Nuveen & Company, Allstate Business Insurance, and Fel-Pro. Her first book, No More Blue Mondays, won a gold Ben Franklin award in 2000.